It is always refreshing to be able to get out of the city and spend time on the white sands of the shore of some island. One such place is Panglao, Bohol. There is unimpeded view of the blue sea, the relaxing feel of white sand, the combined effect of sunlight and sea breeze on your skin, and some shade of palm providing a bit of cover. 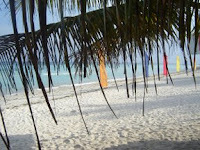 See all that here in this photo I took at Dumaluan Beach Resort. Lovely, isn't it?